Wiring or rewiring a building is a big job, but somebody’s gotta do it. There’s no electrical job too big for us at Lightfoot. Seriously. Our electricians have designed and installed wiring for many different customers in many different situations, and they can do it for you, too. Whether you are building a new addition to your home or business, installing outdoor lights or a spa, or have another project in mind, our electricians will get everything working and up to code efficiently. When you call us, we’ll send out a crew to assess your needs and write up a proposal so you know how much it will cost and how long we expect it to take. Installing new wiring doesn’t have to take forever and, with Lightfoot, it won’t. We work swiftly and skillfully, so your wiring will be finished sooner than you might expect. Our team of electricians is led by a Master Electrician in Burleson TX, so you can be assured that everything will be done safely and will pass inspection when we’re done. Some of these can be scary things to notice in your home or business, but give us a call rather than worrying about it. 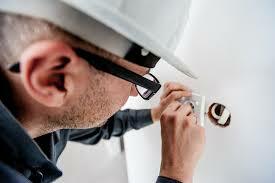 We’ll send out an electrician who will evaluate your current wiring and let you know what needs to be done to fix it. We’ll tell you how much you can expect to spend on your wiring issues and how long it will take us to fix them. Once you hire us, we’ll work as fast as we can to get everything back to normal for you. Don’t let these problems become dangerous. A home that needs rewiring is often a fire hazard, and no one wants their home or business to go up in smoke. Putting off rewiring just asking for a fire. Instead, let our expert electricians handle the problem. We know that having your home rewired is stressful, and we’ll do as much as we can to alleviate that. Whether you need wiring or rewiring, we have some of the best electricians Burleson, TX has to offer. Call us, and we’ll get everything working in a way that is safe and efficient. Don’t worry, just give us a call!